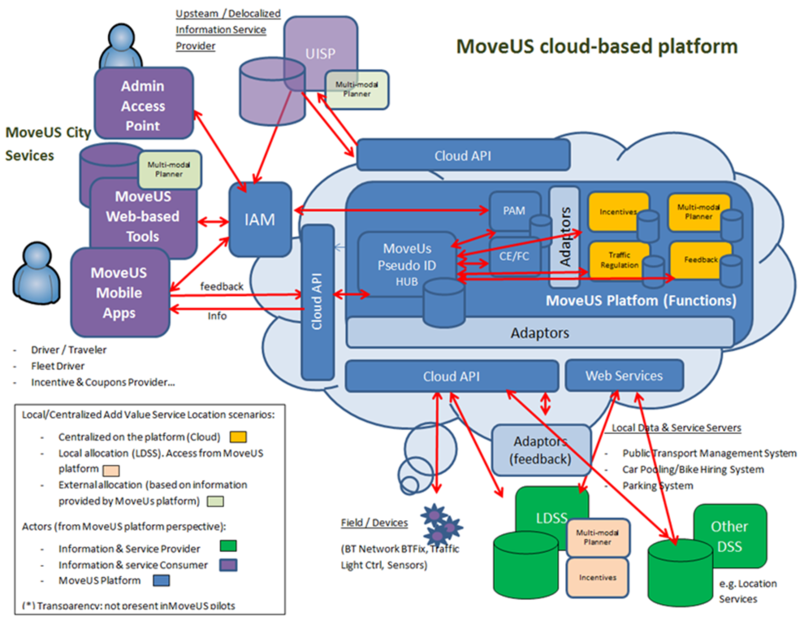 A cloud-based mobility management platform integrating different transport and traffic management components which are able to collect heterogeneous data and process these data to infer valuable information of the traffic status and users’ mobility patterns, ensuring data privacy and security all along the handling process. The data is collected in different formats and come from different sources: asynchronously from the user through the mobile application (e.g. mobility patterns, preferences) or synchronously (position in real time), from conventional sensors and ITS systems and from historic databases (e.g. public transportation schedules) or mobility companies. External (new City Services apps/webs). Common Agreed Standardized Interface (CAI), which determines exactly the information exchange and syntaxes, providing a standardized access. Different communication models: pull, publish/subscribe. Independent Identity & Access Management (IAM) component responsible for establishing users' identity during registration and authentication. Context awareness functionality and application tailoring (geographical, user profiling).